Screen shot of the game Auld Lang Syne from Pretty Good Solitaire. 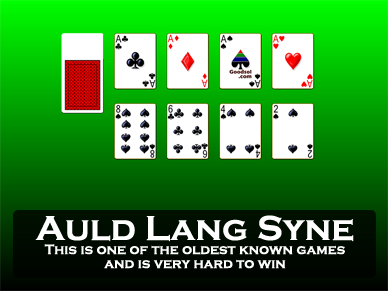 Auld Lang Syne is a very old solitaire game that is very difficult games to win. It is very simple to describe and play, but very hard to actually win. The aces are removed from 1 deck and are used to start the 4 foundations. The foundations are to be built up regardless of suit to Kings. Play consists of dealing out 4 cards at a time in rows in the tableau below the foundations. After each row is dealt, any cards that can be played up the foundations are moved. You can't move cards within the tableau and there is no redeal. Albert Morehead & Geoffrey Mott-Smith in their 1949 book estimated the win rate at 1 in 100 games. Various computer algorithms for playing have only won about 1 in 4000 games. 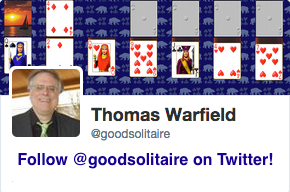 Pretty Good Solitaire players have been winning about 1 in 500 games. While there is some bit of element of skill involved in the game when there is occasionally a decision to make choosing between 2 or more possible moves, for the most part Auld Lang Syne is an automatic game. It can be fun to play if you want something mindless. A number of variations have been created by people looking to inject some skill into the game. 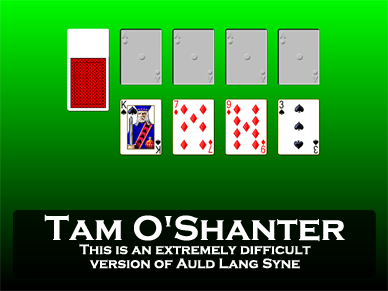 An old variation that actually makes it more difficult is Tam O'Shanter. In this game, the aces are not dealt out at first and instead come out during the game. Tam O'Shanter can only be won once for every many thousands of games. A game that makes it easier is Acquaintance. Acquaintance adds 2 redeals to the game. This gives you a fighting chance to win most positions. Another variation is Sir Tommy. 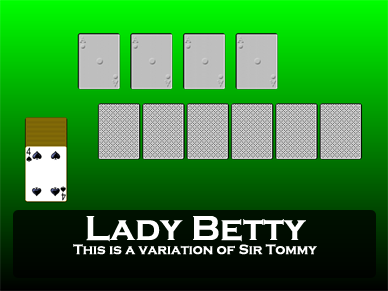 In Sir Tommy, instead of dealing out the cards 4 at a time, the player can choose which pile to place each card. This greatly increases the skill level of the game. 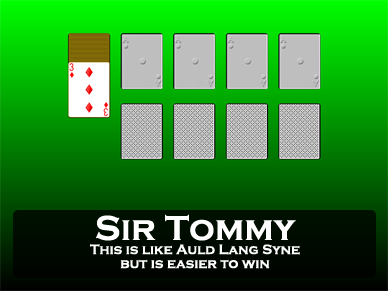 Sir Tommy may actually be an even older game than Auld Lang Syne. Mary Whitmore Jones in her 1899 patience book wrote that it	might be the first solitaire game invented and that it dates "back as far as the beginning of the century, if not further", by which she means the year 1800. In an 1869 book, Sir Tommy is referred to as simply "solitaire", in much the same way that Klondike is now often called solitaire. 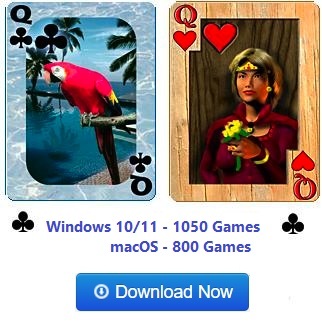 At the time it apparently was the most well known solitaire game. Morehead & Mott-Smith invented a variation of Sir Tommy called Strategy. Strategy takes everything full circle from Auld Lang Syne. Instead of a difficult to win game lacking skill, Strategy is a game that involves complete skill and can be won nearly every time with good play. 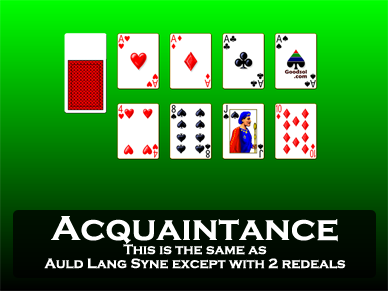 Auld Lang Syne is one of the 850 games in Pretty Good Solitaire and one of the 101 games in Goodsol Solitaire 101.